Babka, as most of you know, is a traditional Easter coffee bread from Europe. 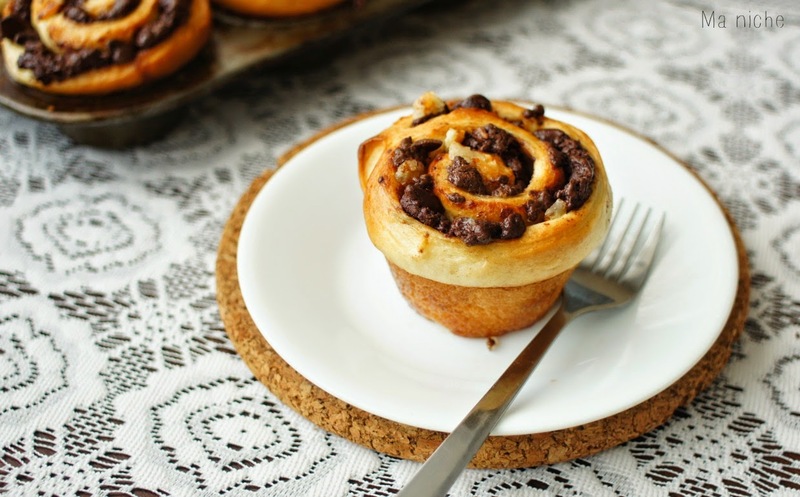 Apparently, babka is also the word for grandmother in Polish... which is why a traditional babka bread was usually baked in a fluted round mold with a center tube and was said to resemble a women's full skirt from centuries past. The babkas as we know them today are elaborately flavored and heavily downsized... 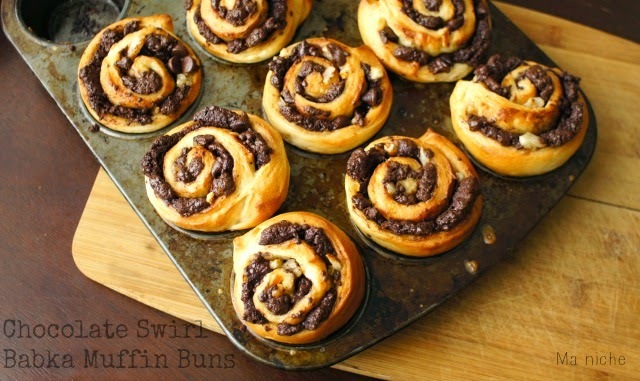 They are strueseled, swirled in chocolate and cinnamon and baked in ordinary loaf pans.. This version, nevertheless delicious, is believed to have descended from the Eastern European Jewish tradition. There are a few places where I went astray from the given recipe..
Two. Dare I say, the chocolate and cinnamon mixture did not seem decadent enough. So I sprinkled it some candied orange peel and an extra handful of chocochips. As expected the combination of chocolate cinnamon orange and extra chocolate was awesome. Three. Now this one is just an observation.... On my first go I baked the muffins in ramekins. For whatever reason husband and I both thought that the ramekin-baked ones had a softer and fluffier texture. 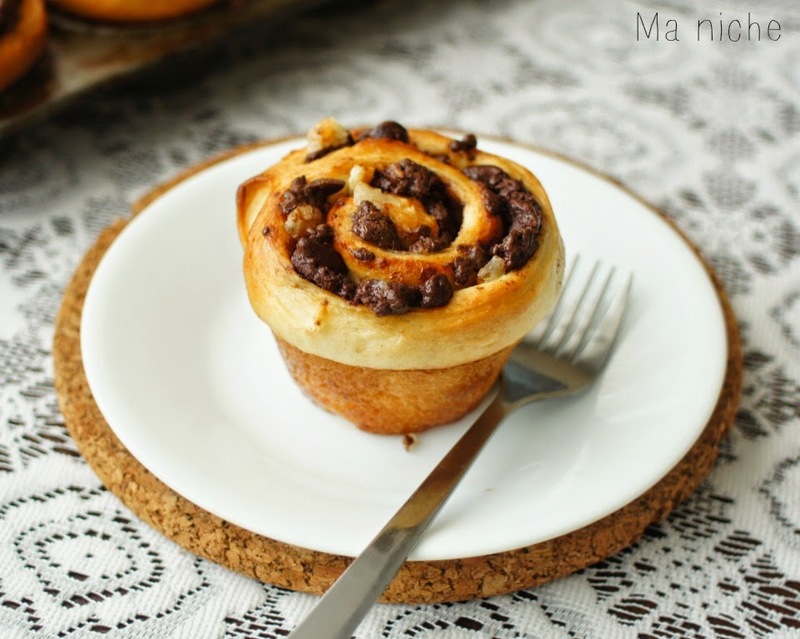 So if you like bake your buns in ramekins and prepare to be delighted ! Put all the ingredients for the dough in the pan of the bread machine in the order recommended by the manufacturer and set the machine for the dough cycle. In case the dough has not doubled by the end of the cycle, let it stay in the bread machine pan for a little longer. My dough took an extra 40 minutes beyond the dough cycle to double up. While the dough doubles prepare the chocolate filling. Pulse the chocochips, sugar, salt and ground cinnamon in your mixer grinder until the chocolate is finely chopped and is almost powdery. Add the butter and pulse again. The mixture will look somewhat crumbly. Keep it aside. Once the dough has double, cut out a long sheet of parchment paper and turn the out on it. Using the rolling pin, roll out the dough into a 20×12 inch rectangular sheet. Sprinkle the prepared filling evenly on the rolled out dough, leaving at least half an inch along the edges. Sprinkle the candied orange peel and extra chocochips (if using) in the empty spaces in between. Using a spatula, press the filling into the dough, then tightly roll the dough back over the filling from one short end to the other. Pinch the open ends in case the filling seems to come out. I did that. Glaze 12 muffin cups or 12 ramekins of ½ cup or ¾ cup capacity. Place the cut out dough into the prepared muffin cups/ramekins, cover loosely with a plastic cling wrap and allow to rise for another one hour. Meanwhile center the rack and preheat oven to 350 °F. When the dough is ready to be baked, brush the dough surfaces with a mixture of milk and heavy cream and transfer the muffins cups/ramekins into the preheated oven. Bake for 20 minutes, until puffed and brown. Thanks to Tamy and Swathi for the treat ! We really enjoyed it ! 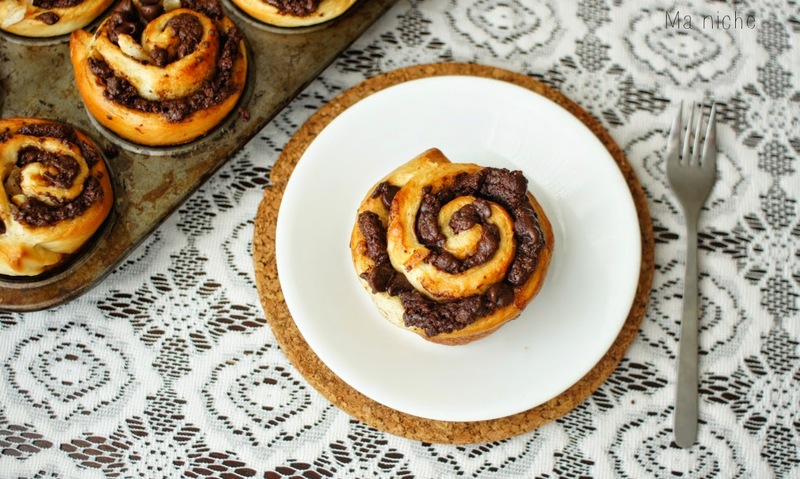 These babka muffin buns are being yeast-spotted. Also sharing them at the following parties..
Beautiful muffins looks very nice. Glad you liked it. You've done a wonderful job!! 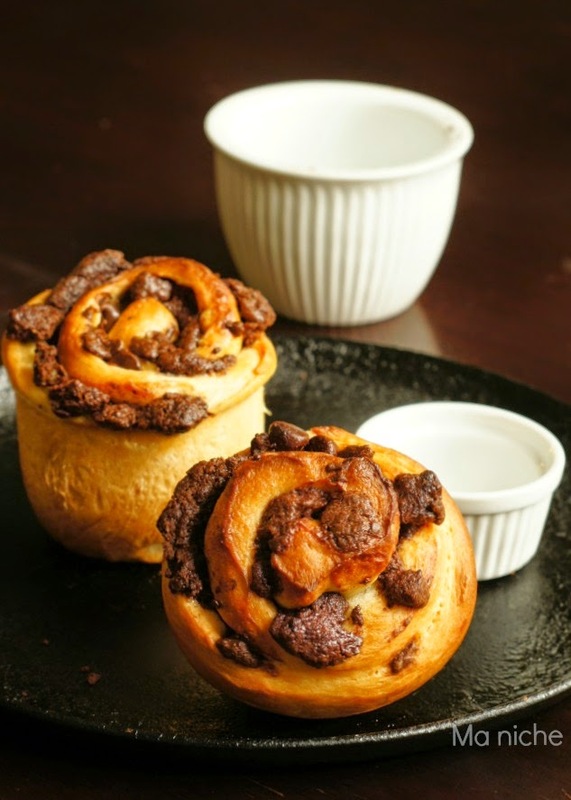 I love the idea of making little babka, and I also like your recipe. Your muffins are so mouthwatering in appearance and I can't wait to try them. Thank you for sharing with the Clever Chicks Blog Hop! I hope you’ll join us again next week! My mouth is watering! Thanks for sharing the recipe and the story too. happy weekend! These sound delicious, and they're beautiful too!